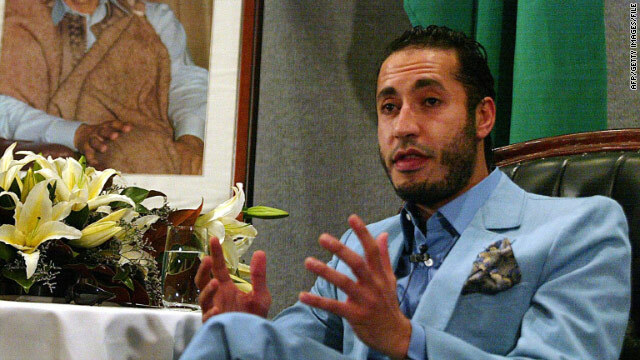 Saadi Gadhafi, son of Libya's embattled leader, said he had the authority to negotiate and wanted to discuss a cease-fire. Tune in to "AC360º" at 8 and 10 p.m. ET for live reports from CNN reporters on the ground in Libya. (CNN) -- The businessman son of embattled Libyan leader Moammar Gadhafi appears to be out of rebel hands and says he wants to negotiate a cease-fire to save Tripoli from "a sea of blood." In an e-mail exchange with CNN Senior International Correspondent Nic Robertson, Saadi Gadhafi -- whose capture had been announced by the rebel leadership on Sunday -- said he had the authority to negotiate and wanted to discuss a cease-fire with U.S. and NATO officials. "I will try to save my city Tripoli and 2 millions of people living there ... otherwise Tripoli will be lost forever like Somalia," he wrote. Without a cease-fire, he added, "Soon it will be a sea of blood." Saadi Gadhafi was one of three sons of the now-hunted Libyan leader who the rebel National Transitional Council announced had been captured during their weekend advance on Tripoli. However, they said Monday that one of the other two, Mohammed Gadhafi, had escaped. And Saif al-Islam Gadhafi -- a top adviser to his father -- made an appearance before international journalists early Tuesday to refute reports of his arrest. Where is Libya's leader, and how long can he hold out? There was no immediate comment from NTC officials on Saadi Gadhafi's status or his offer, made a day after rebel forces overran his father's Bab al-Aziziya compound and claimed control over nearly all of Tripoli. Libyan government officials have made several previous cease-fire offers during the course of the six-month revolt against Gadhafi's 42-year rule.